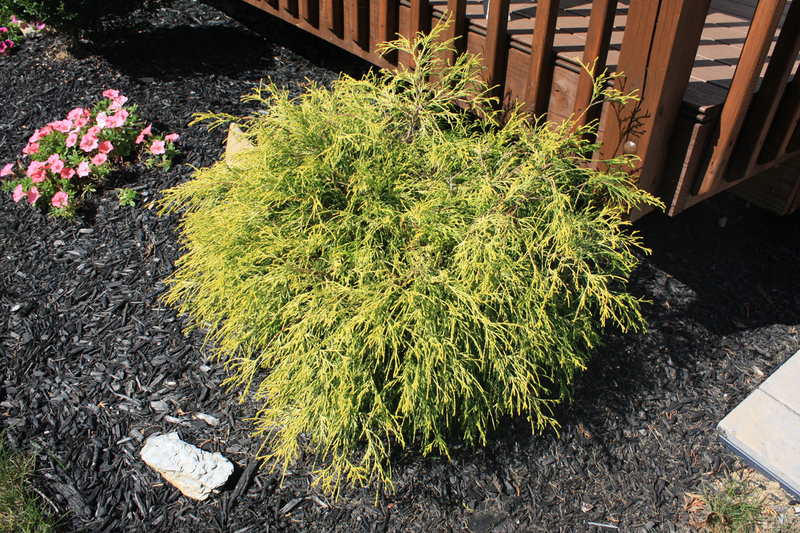 Chamaecyparis pisifera ‘Golden Mop’ is known for its dramatic foliage. It stands out from the landscape with glowing gold foliage and is a must in most landscape beds. This evergreen shrub is slow growing and typically only get to about 2-3′ tall and wide over the first 10 years, eventually maturing to as much as 5′ tall. It contains bright yellow and green feathery and stringy looking leaves. The tips are more yellow while the underside and the interior of the foliage are more greenish. The foliage stays that color unlike most gold/yellow colored evergreen that fade into a green color with maturity. The common name, as “Golden Mop’ refers to the distinct look it has to a mop head. 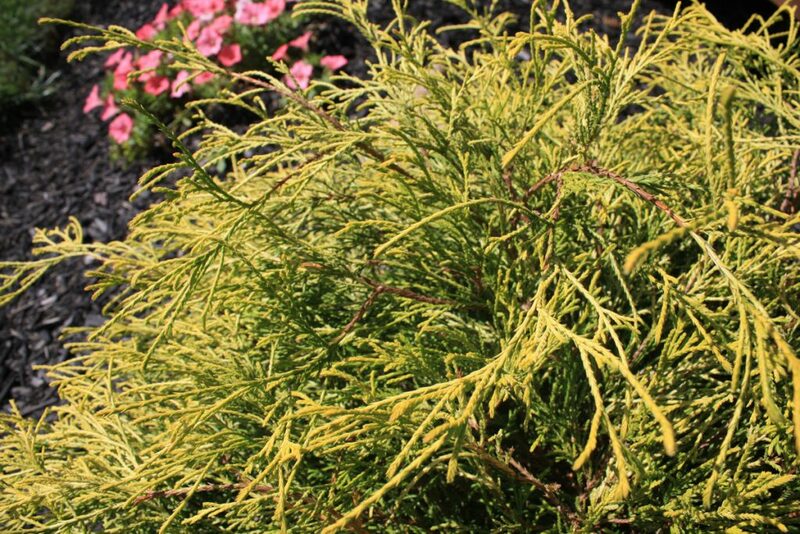 The glowing yellow (or gold) foliage creates a lovely accent to deeper green conifers and looks great paired with almost any other shrubs or plants. For larger beds, it looks stunning when grouped of three or more. If your landscape bed is smaller, then it can also do well planted as just one for added color or seasonal appeal to an area. Color is best in full sun, but will do fine in part shade. However, ‘mops’ in full sun in northern regions may be susceptible to winter burn. Regular watering is important, especially in the first season to establish a good root system. To control size, prune out branches to a joint to retain the unique shape. In ideal conditions ‘Golden Mop’ can grow larger. ‘Golden Mop’ is an excellent foundation plant for small spaces, in border plantings or edging a shrub border.